From high-fashion brands and department stores to unique Christmas markets, get your under the tree presents ready with a Christmas shopping trip in the city. Check out some of our favourite places to go to get your Christmas shopping fix this festive season. Just a 10 minutes’ walk from The Cavendish London, this pedestrianised shopping hotspot in Soho boasts over 150 brands, from unique independent products to illustrious streetwear boutiques and global flagship stores, making it one of London’s destinations of choice to do your Christmas shopping. From 9 November, experience the Carnaby Christmas Carnival packed with live music and street performances under beautifully illuminated Christmas lights. 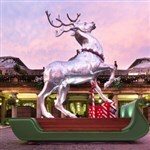 This Christmas, witness the beautiful area of Covent Garden being transformed into a magical land filled with sparkling Christmas lights, picture perfect festive decorations and the most ‘instagramable’ Christmas reindeer statue. Go crazy Christmas shopping with artisan Christmas pop-ups and famous British brands. Finally, no Christmas shopping trip in London is complete without paying a visit to the Queen’s grocer and retailers in Jermyn Street, home to British homegrown goods company. Shop for limited edition Christmas products, from the Queen’s favourite Christmas puddings at Fortnum & Mason and bespoke perfume by Florist to British Cheddar at Paxton & Whitfield, all perfect for a festive gift. Stay at The Cavendish London with our special Festive Christmas Break rates from £189 per night for two with English breakfast and WiFi. Book now and get your Christmas shopping sorted!